Strength training promotes muscle growth and strength, but not without first driving the body into a catabolic state that breaks down specific muscle tissue components, such as glycogen and protein, to supply the energy required for muscular function during exercise. Naturally, the diminished protein replenished to prevent the potential loss of lean body mass and diminished exercise performance. The post-workout consumption of lean protein and complex carbohydrates is an important part of the replenishing process augmenting muscle growth and performance. In addition, post-workout consumption of leucine, creatine and betaine have also been shown to potently replenish the muscle cell, enhancing muscle growth and function. 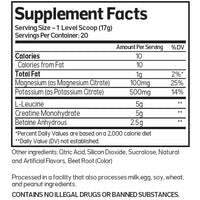 This is why leucine, creatine and BetaPower™ Betaine are found in Advanced Molecular Labs’ (AML) Postworkout. 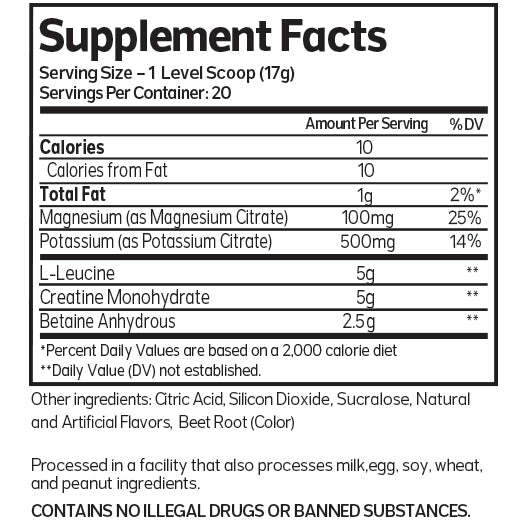 The essential replenishment of muscle protein and glycogen levels from the post-workout consumption of leucine, combined with the synergistic muscle-building compounds creatine and betaine, will provide a robust biochemical milieu within the muscle cell-driving exceptional growth and strength. LEUCINE STIMULATES POST- WORKOUT ANABOLISM. POTASSIUM CITRATE FOR BUFFERING LACTIC ACID AND ELECTROLYTE REPLACEMENT.